A tricky, tricky pattern…. Did it attract your attention when you first saw it? I know many liked it: so urbane and stylish in Vogue’s envelope photo with it’s bias cut wide A-line (not circle) skirt, nipped waist and flounced peplum. It is offered in size 8 (bust 31.5, waist 24, hip 33.5) to size 22 (bust 44, waist 37, hip 46). Let me start by saying that this is the hardest post I’ve ever done since I started blogging in 2006. I have taken days to work up my courage. I have had a total Blogger’s Meltdown and been paralyzed with fear. This is a test. It is not a wearable muslin. Please don’t tell me how to fix this thing. Just take the facts from this humiliating and public display of raw, un-photoshopped photos and determine if this is really a style that would work for you. Warning: some photos maybe too graphic for delicate sensibilities. Viewer discretion is advised. OK, the length is not bad but look at how the skirt front dips down? That’s because the waist band needs to be tighter to hold the skirt level at the waist. So cut it smaller than you normally would. Also oddly, there is only one pattern piece for the front and the back. A back piece should be wider than the front by an inch or so as most people are wider across the back. 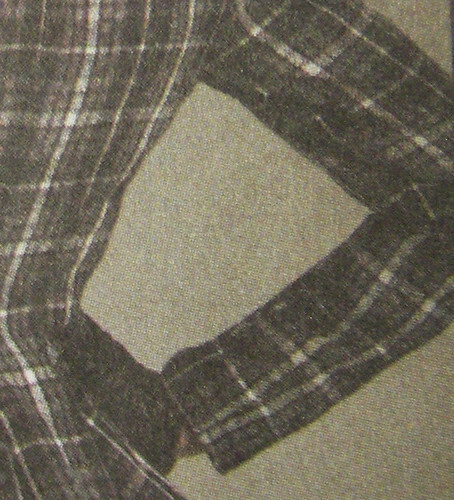 I only had an RPL (rayon polyester lycra) in a comparably sized plaid and I had plenty of it with no real plans for a serious garment. It is a bit beefier than a woven wool suiting but not by much so it became my “muslin” fabric. 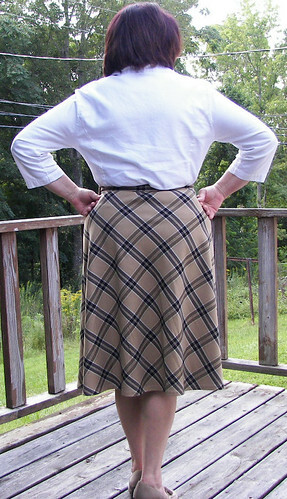 The plaid on the bias widens the back view…need I say more? It demands a jacket. Hmmmm, maybe I can stand to see it from the front??? Oh , no, not so good either…well maybe a quarter turn will do? Enough with the plaid already! Not even adding a wide belt would help. Perhaps done in a more muted plaid like the dark grey shown on the envelope…naw. I don’t think that this jacket and skirt would work well together on anyone shorter than 6 foot tall and really, it’s not a good look for anyone who is over a size 2. Oh wait, it’s not offered in a size 2. On top of the fact that there’s almost one and a half full circles of fabric over your behind, the jacket instructions and lining pattern piece have you line to the edge so there is an added line of stitching to stiffen those folds. Refer back up to my jacket photos. I have cut an 18 and taken out an extra inch of width tapering from the elbow dart down to the sleeve hem. Hmmm. Somehow, it just does not look like the same outfit. So my dear readers (I hope after these shocking photos I can still call you friends) I am going to close this chapter now. I have mustered up the courage to post this and, if I were a rational person, I’d go on a week long vacation or a major margarita bender, which ever comes easiest, but when it comes to sewing and art, I’m just not that rational. No loss to me of the fabric and my time is not as precious as it once was. I’ll be all right. I hope I have saved at least one of you some time, fabric and effort. The keynote speaker at the conference is Gail Gondek, pattern designer for Chado Ralph Rucci, Geoffrey Beene, Ralph Lauren, Marc Jacobs, and Peter Som. Her talk, Concept to Catwalk, ” will shed light on the often mysterious pattern design process that produces a fashion masterpiece at the highest levels. Her work has been shown at the Paris Couture and Pret-a-Porter shows and regularly at New York’s Fashion Week for the past 20 years.” Some of her pieces have been displayed at the Metropolitan Museum of Art, the Museum of Modern Art, the Museum at the Fashion Institute of Technology, the Fashion Museum at Kent State University, and the Museum of Contemporary Art, Los Angeles (MOCA). The photos attached to the press release show some of Ms. Gondek’s marvelous work, including some startling macramé inserts. I was intrigued by some of the construction shots that were included in the press pack. This seemed particularly serendipitous, as my neighbor showed up wearing a wonderful knit tank top with a macramé back just 3 or 4 days ago. Time to bust out those macramé skills that are long dormant, or ask your grandma to give you some pointers on technique? First make a ton of plump bias spaghetti cord out of your fabric, then experiment with some knotting. It’s great seeing this treatment at the very high end of haute couture, alongside the much more mainstream 2×2 rib knit top with the matching jersey knotted cord. The Pyramid dress pattern I ordered from center for pattern design because I was intrigued by the designs from the UK designer Julian Roberts.You can see him at work by watching 2 videos. The pattern is made by Sandra Ericson and based upon the principles of Julian Roberts system of Subtraction Cutting. I was interested to see how this pattern was drafted and to see how this design looked like in real which I could not really judge by the pattern design picture. 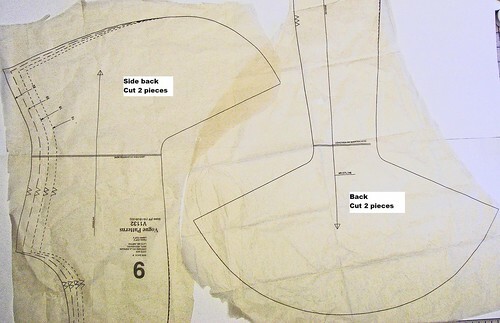 The pattern is partly drafted ( bodice part) you only need to draw the skirt portion which is a large circle around the pattern depending on the length you prefer. Because this pattern needs one XL piece of fabric I tried this pattern by making it at ½ scale for my dress model so I had no piecing to do. I measured the pattern and draw a 1/2-scale pattern from it. As you can see there are no seams in the skirt portion of the dress.It looks like a doughnut shape. The fabric I needed was 1.20 meter by 1.20 meter (1.312 x 1.312 yard) for my ½ scale pattern .So in other words if I would make this dress in a real size I need about 2.40 m by 2.40 m (2.624x 2.624 yard) that’s why you need to piece the fabric to get that wide. Suggested bias fabrics: Loosely woven wools, silks or cotton; wool or silk crepe, crepe backed satin, silk velvet, georgette or chiffon. I used stretch polyester satin for this unusual funky dress, and because it is only for showing on my scale dressmodel I did not finished the seams just use my pinking shear. 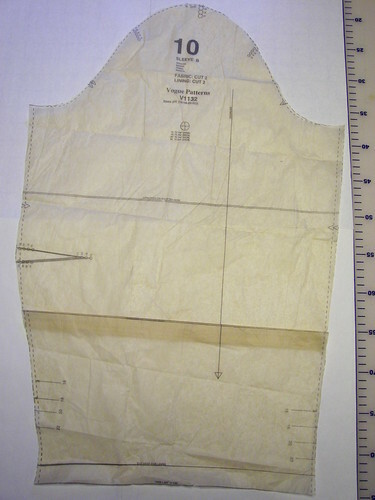 The instructions mention to sew stay tape at the shoulder seams to prevent stretching,I fused some pieces of fusible interfacing at the sharp angles at the partly side seams, and finished the armholes and neckline with binding finished wide 2 mm wide (0.078 inch) from bias cut self-fabric. I stitched the bias cut strip of fabric right sides together at armhole and neckline and pressed the seams towards the bias cut piece, I folded the bias cut fabric around the seam allowance and hand stitched the piping in the ditch from the right side. Sewing it by hand gave me more control because of the small scale than using the sewing machine. Now there was no need to pin or baste first. The hem is uneven after sewing the dress and due to the bias cut I left it un hemmed for a few days.But you also can leave it as irregulare level but I choose for an even hem. I marked the hemline with chalk using my lead measuring tape. The hem wide is very wide 5.88 meter (nearly 6 ½ yard) at ½ scale and I finished it by just turning in and stitched from the wrong side a few hairlines away from the fold.This way it looks neat on the dress model but for a real size dress it is not a good way because the raffles are still there. If you want a unique funky dress this is the one that you should make. The sewing is easy, the pattern is printed on sturdy paper and the instructions are clear there are even some variations like using the side flaps to use as pockets. PS. I am not planning to make this dress in my size, I only made it out of curiosity. The cover dress picture has the folds at center front sewn differently, this is described in the pattern as variations on the theme.I folded the 4 corners flat at all the sides to achieve a more slimming view. At the next pictures you can see the corners or cowls at the center, left, right and back of the dress. Several high profile designers have some interesting jewelry in their collections right now. Both Albert Elbaz at Lanvin, and Oscar de la Renta have some statement pieces that rely on needle and thread as much as chains, pearls, and beads. Here are some of my favorite pieces in this category of sewn jewelry. Let us know if you have seen any other examples of sewn jewelry online. It’s a fascinating category.